Neil Leifer is the best-known sports photographer of the past half century. Beginning in 1960, his pictures have regularly appeared in every major national magazine, including the Saturday Evening Post, Look, LIFE, Newsweek, and, most often, Sports Illustrated and Time, and his photographs have run on over two hundred Sports Illustrated, Time, and People covers. Leifer has photographed sixteen Olympic Games, fifteen Kentucky Derbies, countless World Series, the first twelve Super Bowls, four FIFA World Cups, and every important heavyweight title fight since Ingemar Johansson beat Floyd Patterson in 1959. He has photographed his favorite subject, Muhammad Ali, at thirty-five of his fights, including all the big ones. 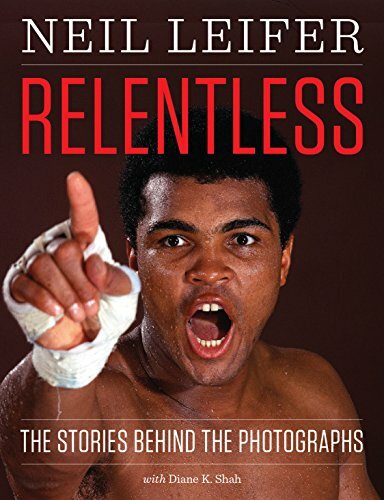 Now, in Relentless, Leifer takes us behind the scenes of some fifty of his most iconic pictures. Starting with his shot of Baltimore Colt Alan Ameche scoring the game-winning touchdown against the New York Giants during sudden death overtime in the 1958 NFL Championship game at Yankee Stadium—taken on Leifer’s sixteenth birthday—he tells enthralling, often hilarious stories of getting to the right place at the right time to capture many of the legendary athletes of the twentieth century, including Mickey Mantle, Arthur Ashe, Willie Mays, Sugar Ray Robinson, Joe Namath, and Arnold Palmer, as well as shooting presidential and celebrity portraits and covering a variety of subjects for Time. Recapping both an incredibly successful career and the transformation of photojournalism since the era of the great photo magazines, Relentless effectively chronicles fifty years of American popular culture..